Hello, and welcome back to our blog! Like humans, our canine companions are susceptible to heat exhaustion, dehydration, and sunburns. With the intense heat and humidity here in Kansas City during the summers, pet parents will want to take the necessary precautions to protect their precious pups from the sun and heat. 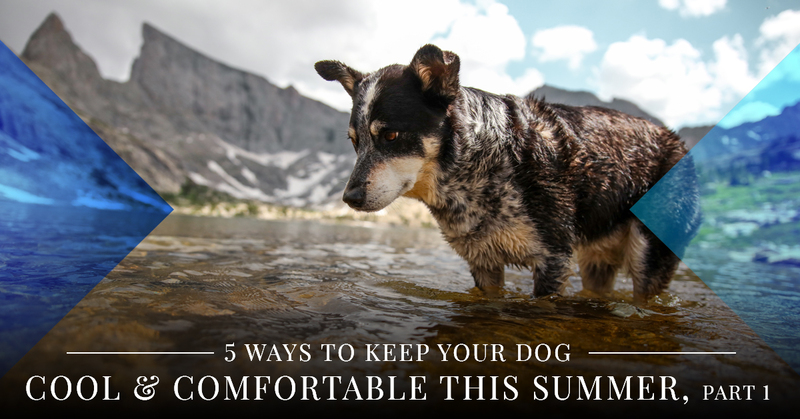 As your trusted animal hospital and doggy daycare center here in Kansas City, we have some helpful tips for you to consider to help you keep your dog cool, comfortable, healthy, and safe this summer. Whether you need to bring your dog in for their routine vet exam, dog boarding services, or doggy daycare, the Eagle Animal Hospital and Pet Resort team is here to help, and always has your dog’s wellbeing in mind. The sun’s rays can make concrete, gravel, and other paved surfaces incredibly hot. Hot surfaces can be very dangerous for your dog’s feet, posing the risk for burns to their foot pads. Before taking them on a walk, take a few minutes to check the temperature of the sidewalk and other surfaces where they may walk. Use the back of your hand to touch the surface. If it’s too hot for your hand, it’s too hot for your pup’s feet. Wait until the sun goes down to walk them or consider getting your dog paw booties to protect their feet from hot surfaces. In general, the sun burns at its hottest at noon, but temperatures here in Kansas City are often at their hottest between 3 and 4:30 in the afternoon. Typically, it is very hot and humid between 10 am and 4 pm, so it’s always good to limit your dog’s playtime outdoors during this stretch of time, but especially during the later afternoon time. When it’s hot and humid, your dog can become overheated and dehydrated, which can lead to excessive panting, heavy breathing, and exhaustion. Wait until it cools down to play and walk outside. Whether you are sitting outside with your dog, taking them for a walk, or leaving them outdoors in a secure dog run while you’re away, your dog needs constant access to water. Dogs can become dehydrated when they don’t drink enough water. Always make sure their water bowl is full and be sure to carry plenty of water with you on walks, trips to the park, or even when driving around with your dog. If you kennel your dog while you’re away, install a small dog bowl in their kennel so they can access water there, too. And if you leave them outdoors for a short time, give them at least two bowls for water to help ensure they don’t run out of water. If you leave your dog outside while you run errands or go to work, it is crucial that they have plenty of shade to shield them from the sun. While dog houses do provide shade, they also trap heat, making them more like a sauna than a reprieve from the hot sun. Instead, make sure they have access to shade from a tree, a porch, or an awning that covers their dog run. Keep in mind that leaving them outdoors for short amounts of time is best to ensure they get a break from the sun, heat, and humidity. Avoid leaving them outdoors for longer than an hour. If you don’t have the means to keep them protected from the sun and heat while you’re at work or on the go, you might consider enrolling them in doggy daycare in Kansas City. Doggy daycare gives your precious pup a safe, comfortable place to play and rest while you’re away. Along with providing a safe and secure place for your dog to play and socialize with other dogs, our doggy daycare facility is temperature-controlled, spacious, and they will always have access to fresh drinking water. Give Eagle Animal Hospital and Pet Resort a call to learn more about our doggy daycare and dog boarding services today! Our doggy daycare team would love to care for your furry friend so you can work, run errands, and handle tasks without fear or worry of whether or not your dog is safe and comfortable. Call us today!